If you want to live longer, you might want to take your dinner plate on a trip to Club Med. 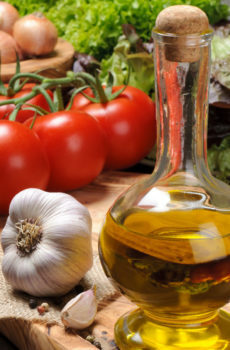 The Mediterranean diet has been researched in hundreds of studies for its effects on health and longevity and this new study, a subset of the Nurse’s Health Study, suggests that part of the diet’s benefit may be its effect on your DNA. In this study, which looked at over 4000 healthy women, researchers found that women who adhered most closely to a Mediterranean pattern of high fruit, vegetable, legume, olive oil and grain intake with limited amounts of meat and dairy, had the longest telomeres – suggesting that this pattern supports health at the genetic level. Telomeres are essentially protective ‘caps’ on your DNA strands; shorter caps have been associated with premature aging and disease. It is thought that oxidative and inflammatory stress can lead to shorter telomeres. The foundation of the diet – fresh, whole plant foods – is well known to combat oxidative and inflammatory damage and interestingly, analysis showed that no one food could explain the beneficial effects. It would appear that it is the combined effects of the diet as a whole that is supportive. This study confirms what health professionals have known for years: that no one food will bring better health; it is a pattern of whole plant foods that will help keep you feeling well for years to come. This latest study on the Mediterranean diet was well designed and adds to the support for an eating pattern that places vegetables and whole grains at the heart of a healthier lifestyle. Whatever your preferred dietary pattern, for a longer, healthier life, make half your plate vegetables at every meal and enjoy healthy fats from extra virgin olive oil, nuts and seeds.